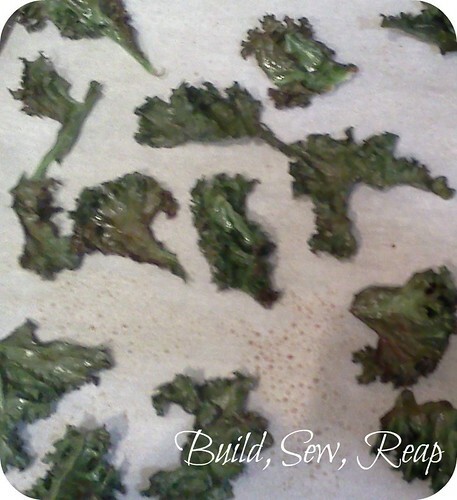 First in the Bountiful Baskets series is kale chips. We got a head of kale in a recent Bountiful Baskets pickup. I had heard of these green chips but thought they sounded awful. Not knowing what else to do, I gave them a shot. Boy was I ever surprised!! I even convinced the Snickerdoodle to try them then immediately regretted it as he kept asking for more and I didn't much want to share. Preheat oven to 350 degrees (f). Line a cookie sheet with parchment paper. Tear the leafy parts of the kale from the hard stalk. You can discard the stalks or save them to add to homemade veggie broth if you'd like. I tossed mine 'cause I wasn't thinking. 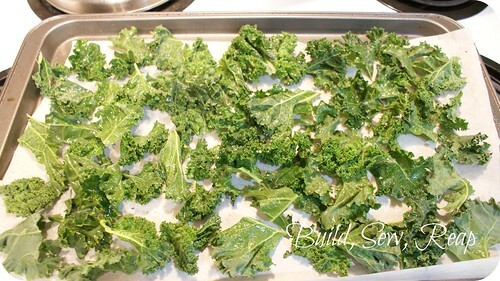 Spread the leafy parts on the lined cookie sheet. You don't need to leave a lot of space between them but try not to make more than 1 layer. Spritz them with olive oil and lightly salt them. Put them in the oven for 10 minutes. Watch them, when the edges start to darken, they're probably ready. I like them really crispy so I made sure they were well done but I suspect if you leave them in too long, they'll just turn to dust so keep an eye on them. much that the tray is full before and sparse after. picture until after I had already eaten them all and couldn't reshoot. That's it, they're ready to eat. I can't tell you how to store them as ours pretty much went straight from the cookie sheet to our mouths. Yum. I love kale! Ever heard of Greens and Beans? You can use the kale as the green, saute it in a pan, with onion and garlic add some white beans and some chicken broth and you have a simple side or soup! I love Kale just sauteed though! Yum. Were growing it again this year!